It began with [[Virgin America]]. The ultra-hip low-cost carrier chose Boston’s [[Boston Logan Airport – BOS | Logan airport]] as its newest destination a few weeks back (after being snubbed by Chicago), and will begin flying from Logan to [[ San Francisco International Airport – SFO | San Francisco]] and [[Los Angeles International Airport – LAX | Los Angeles]] in February. 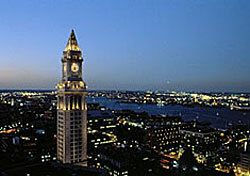 Almost immediately, [[JetBlue]] reinstated its planned-then-canceled Boston-San Francisco service on a seasonal basis. Now comes news that JetBlue and [[American Airlines | American]] will increase service from Logan in the coming months. According to the Boston Globe, JetBlue “will add second daily flights to [[Charlotte Douglas Airport – CLT | Charlotte, N.C.]]; [[Chicago O’Hare – ORD | Chicago O’Hare]]; Pittsburgh; and [[Raleigh-Durham International Airport – RDU | Raleigh/Durham, N.C.]]; a third flight to Buffalo, N.Y., and Long Beach, Calif.; sixth and seventh flights to [[Washington Dulles Airport – IAD | Dulles]]; and a ninth and 10th flights to [[New York John F. Kennedy Airport – JFK | JFK]].” This expansion was announced in October, but the details were released only recently. Suddenly, it seems, Boston is a hot commodity. Is it something in the “Dirty Water“? More likely it’s the fact that Boston was hit by industrywide capacity reductions, which gives growth-minded airlines like Virgin America and JetBlue an opportunity to fill in the gaps. Virgin’s move to Boston cannot be overlooked either, because the airline gives customers another low-cost option. This is all well and good for Boston residents (including yours truly—SmarterTravel.com HQ is located in Boston), but what about the rest of the country? For starters, Logan has a strong Europe market, which makes Boston an appealing alternative to connecting through New York. But on a larger scale, Boston is an example of how the voids left by capacity cuts can be filled: with smaller, healthier and opportunistic airlines (primarily low-cost carriers) that are willing to take a risk and fly abandoned routes.